GNX375 & GPS175 Install Times? Sarasota Avionics quoted me $11K with $4K on the install labor for a 375 (replacing KLN-94 and KT-76A). 16 Hours seems much better! Does that include integration with your autopilot ect...? However, it looks like they are discounting the device by $1K off MSRP so maybe it's an effective $3K install at MSRP. Absolutely, as @OHAEDO points out we have 11 or 13 degrees of travel. Compare that to a Cessna 172 with 30 degrees or an SR-22 with 108 degrees and it’s easy to see how an inexperienced ramp person can seriously screw up our airplanes if they had been moving around cessnas and cirrus’s all day. I always feel a little uneasy when I land in Key West (or any other busy FBO) and watch the ground handlers tow my plane to parking... I pull the plane around enough on the tow bar to know the nose gear won’t turn very much! Thanks, very helpful info. I’m still leaning towards getting the GNX-375 to replace my KLN-94 and get ADS-B in/out while I wait for a good PFD/MFD solution to replace my Sandell and Vaccum. I apologize if this was covered already in one of the 200 responses, but if I don’t want to put in the Garmin autopilot and preserve my KAP150 (for now) can I put in the G3X and a G5 to drive the autopilot? I was thinking of getting a GTX-345 but now I’m considering the GNX-375 + G3X but don’t want to spend the money for new autopilot. Agreed, I hated to purchase the cellular version as well but at the additional cost for another source of GPS (without having to worry about my phone feeding a signal and always being charged) it seemed like a no brainer. I’m not sure about the G3X but I’m with you on the GPS/ADS-B for $8K. I was about to buy the 345 but with my KLN 94 I don’t see the point. While I know a 750 is also very capable (and has comms), I don’t feel like shelling out $20K for it... Side note: like you, I was going to update the KLN 94 via data download but found that I didn’t have the right software update. I called Honeywell and they overnighted me a card for free AND let me keep my future downloads. I realize these may be worthless but I was pretty impressed with their customer service. Thanks again to you and @mike_elliott, I just ordered it from Amazon and will also try a dimmer screen. Thanks, Id rather not buy from sportys either but the few chargers I have tried can’t keep the iPad charged while using foreflight. If that one works for you I’ll definately give it a try! Thanks. My DC cigarette lighter will only charge my iPhone but not my iPad (I also just ordered the new mini). Has anyone with a similar issue tried this: https://www.sportys.com/pilotshop/flight-gear-charging-bundle.html?utm_source=MarketingEmail&utm_medium=email&utm_campaign=A19034A&utm_content=Flight Gear Charging Bundle&trk_msg=G36SD0ER5RMK1EDJ5HDL08OLUS&trk_contact=8GE8LSE157Q0AA9UD39TGM1TL4&trk_sid=OFQ3OSA9E76CI12O4EV7MJFDE0&utm_source=Listrak&utm_medium=Email&utm_term=https%3a%2f%2fwww.sportys.com%2fpilotshop%2fflight-gear-charging-bundle.html%3futm_source%3dMarketingEmail%26utm_medium%3demail%26utm_campaign%3dA19034A%26utm_content%3dFlight+Gear+Charging+Bundle&utm_campaign=A19034A&utm_content=Get+Ready+For+Sun+'N+Fun+Deals!+Starts+Now! any other solutions that work? thanks! 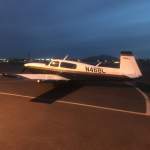 I’m not sure about why it was kicked back but I recently created an LLC to buy my plane and then had the title company handling the sale register the plane with no issues. Although my knowledge is limited, I think this would be more an issue of who fills out the FAA paperwork than the LLC process. In my case it was done by people who do hundreds of registrations per year (and pretty reasonable at $400 split between buyer and seller) so that probably helped. If you’re anywhere near the center of the state I would recommend Phil Jimenez. He’s been working on Mooneys since 1987 and is pretty well respected. MSCs aren’t bad but it all depends on who you get since the mechanics there span all experience levels and may be working on Cirrus’s one day and Mooney’s the next. Again, not a non-starter but something to keep in mind. @JJV7109 I was in a similar search for about 4-5 months (although probably at a slightly lower purchase price). I wanted an Ovation but above all else I wanted a plane that I could use to travel long distances. Given the scarcity of the Ovations, I ended up buying a Bravo. Although I’m sure that I’m in store for some higher maintenance costs, I’ve really enjoyed it so far. There’s something to be said for climbing into the low to mid teens at a constant MP without making a lot of other adjustments. Of course this is available in the K’s as well.